The Corruption Perceptions Index (CPI) 2017, released last week by Transparency International in its 25th anniversary, shows that the majority of countries are making little or no progress in ending corruption. Additionally, it reveals that journalists and activists in corrupt countries continue risking their lives every day in an effort to speak out. 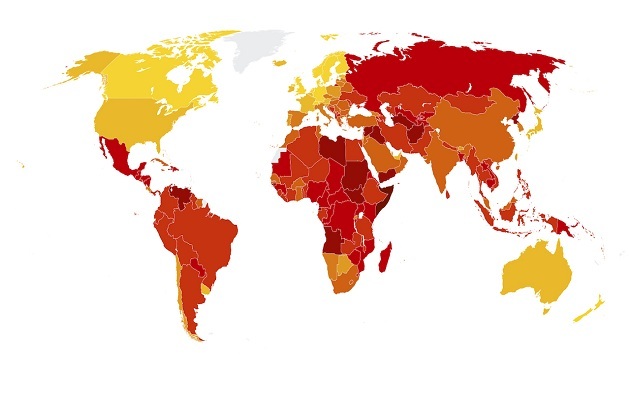 The index ranks 180 countries and territories by their perceived levels of public sector corruption according to experts and businesspeople, using a scale of 0 to 100, where 0 is highly corrupt and 100 is very clean. Transparency International data indicate that in 2017 more than two-thirds of countries score below 50, with an average score of 43. This year, New Zealand, Denmark and Finland rank highest with scores of 89, 88 and 85 respectively. Somalia, South Sudan and Syria got the lowest scores of 9, 12 and 14. The best performing region is Western Europe with an average score of 66. The worst performing regions are Sub-Saharan Africa (average score 32) and Eastern Europe and Central Asia (average score 34). Over the last six years, several countries significantly improved their CPI score, including Ivory Coast, Senegal and the United Kingdom, while several countries declined, including Syria, Yemen and Australia. According to Transparency International, “the rise of authoritarianism across Eastern and South East Europe in 2017 has hindered anti-corruption efforts and threatened civil liberties”. It put the example of Poland, where “government bodies took over the management and distribution of vital funds for non-government organisations”. Similarly, “in Romania, the government put forward a bill which imposes disproportionate reporting requirements on NGOs. Comparable laws directed at curbing NGOs also passed in countries throughout the region”. With the lowest score of 30, Ukraine continues to see attacks against anti-corruption activists, NGOs and journalists exposing corruption. Transparency International has examined the relationship between corruption levels and the protection of journalistic freedoms. The analysis, which incorporates data from the Committee to Protect Journalists, found that in the last six years, more than 9 out of 10 journalists were killed in countries that score 45 or less on the CPI. This means that, on average, every week at least one journalist is killed in a country that is highly corrupt. In addition, one in five journalists that died were covering a story about corruption. “No activist or reporter should have to fear for their lives when speaking out against corruption. Given current crackdowns on both civil society and the media worldwide, we need to do more to protect those who speak up”, said Patricia Moreira, managing director of Transparency International. The study also looked at the relationship between corruption levels and the freedom with which civic organisations are able to operate and influence public policy. Transparency International, along with World Justice Project, shows that most countries that score low for civil liberties also tend to score high for corruption. “Smear campaigns, harassment, lawsuits and bureaucratic red tape are all tools used by certain governments in an effort to quiet those who drive anti-corruption efforts. We’re calling on those governments that hide behind restrictive laws to roll them back immediately and allow for greater civic participation”, Moreira pointed out. Hungary, which saw a ten-point decrease in the index over the last six years, moving from 55 in 2012 to 45 in 2017, is one of the most alarming examples of shrinking civil society space in Eastern Europe, because the recent draft legislation threatens to restrict NGOs and revoke their charitable status. “High levels of corruption also correlate with weak rule of law, lack of access to information, governmental control over social media and reduced citizens' participation. In fact, what is at stake is the very essence of democracy and freedom", said Delia Ferreira Rubio, chair of Transparency International.